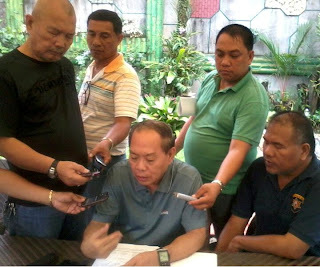 SURIGAO CITY— Exactly thirty days after an alleged plunder case was filed against him, Representative Francisco Matugas gave his adversaries a lesson they would never forget when on March 1 he filed a perjury case with a P10-million claim for moral damages before the City Prosecutor’s Office. Docketed as I.S No. XIII-OS-INV-13B-00056, the case stemmed from the executed complaint-affidavit for plunder which the lawmaker believed had contained malicious imputations intended to besmirch his good reputation and social standing. Named as respondents for perjury were local historian Fernando Almeda, Jr., lawyer Victor Bernal, activist Edgardo Canda and Lolito Golo who had earlier accused Matugas for Plunder (Violation of R.A. No. 7080) before the Office of the Ombudsman on January 30, 2013. They alleged that the first district solon was allotted and had received several millions of pesos as his Priority Development Assistance Fund (PDAF) but had malversed, through illegal expenditure, a total amount of P63,550,000.00 from the said fund when he distributed the same for use in intelligence and anti-insurgency activities in fourteen towns of Surigao del Norte. They argued the said act of Matugas was prohibited by law pursuant to the Decision dated September 13, 2012 of the Commission On Audit (COA) EN BANC. Matugas said Almeda and his cohorts were clearly liable for perjury for making untruthful statements, for falsely testifying under oath and in making a willful and deliberate assertion of falsehood. He denied having allotted, received and distributed several millions of pesos to mayors. “My only participation in the questioned transactions was merely to make endorsements/recommendations as to the proposed allotments. I categorically deny that the PDAF funds were ‘received’ much more ‘distributed’ by me as alleged,” the lawmaker clarified. Matugas said the alleged plundered amount of P63,550,000.00 was a deliberate falsehood as he only requested/endorsed for funding the total amount of P49,500,000.00 which was below the threshold amount required under the law penalizing the crime of Plunder. “If these people had only made a careful scrutiny of readily available documents, they would have found out that P14,050,000.00 out of P63,550,000.00 belonged to PDAF allocations under Cong. Guillermo Romarate, Jr., as well as to other allocations for entirely different purposes,” Matugas disclosed. The first district solon also bared as a deliberate assertion of falsehood the allegations of Almeda and his minions that fifteen municipalities were involved as subject to disallowances/suspensions covered by the said COA decision when there was only ten. Matugas condemned as another asserted falsehood the group’s allegation in the plunder complaint that “no less than the COA itself justified the filing of criminal and administrative cases against Congressman Matugas” when no such statement could be found in the said COA decision and the said ruling had not yet attained finality in view of a motion for reconsideration filed on time. As to accusations that he made illegal distributions of PDAF funds to municipalities outside his congressional jurisdiction, Matugas said the same was a patently false assertion as there was no prohibition under the provisions of General Appropriations Act and other related laws. He even cited a COA ruling upholding the allocation of PDAF funds to districts other than that of the concerned Congressman as legal. Matugas said Almeda’s group made deliberate and malicious accusations as a calculated and sinister method adopted to support their allegation that the amount ‘received’ and ‘distributed’ to local governments was more than Fifty Million Pesos (Php50,000,000.00) to justify a case for alleged Plunder to stand.